Class registration is on a first-come, first-serve basis for adults 18 years and older (15+ are welcome with an adult family member on the premises for the duration of the class). Classes are held during the first four Tuesdays (7-9pm) and Thursdays (6:30-8:30pm) of each month. See class locations and class calendar below. Refunds will be given ONLY when a registrant withdraws from a class at least three business days prior to the first class session - no exceptions. Our Goal is to offer art experiences that encourage the beginner and novice artist - developing basic skills and creative thinking while maintaining a balance between structured approaches and individual self-expression in an engaging, supportive and fun workshop environment. 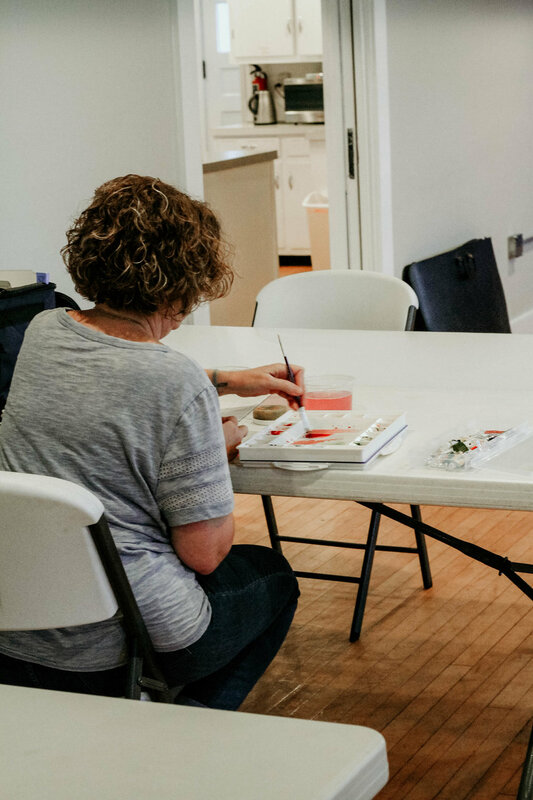 Exploring Watercolors This is an ongoing, monthly class for beginner and intermediate artists who desire to develop watercolor painting skills. This class includes instruction in set up, color mixing and various painting techniques as well as an emphasis on design composition and simple two-point perspective. Students will have the freedom to work on personal projects with instructor oversight along with class assignments that promote skill development. Fill & SUBMIT the form below, then PAY ONLINE to complete registration. Thank you for submitting your class registration form. Please proceed with your payment below to complete your registration. Not only do I enjoy painting, I also love to teach... especially those things that I am really passionate about. I'm not sure I know when any of us become "experts" at anything, but I am excited to share with others what I have learned and what seems to work for me as it relates to drawing, painting & design.